Well so much for a break….Level 53 has arrived! 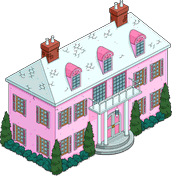 Brockman will kick this off for us….so make sure he’s free (and you’re on Level 53). First build will be Spiffany’s for $1,322,000 and a 24hr Build. Sorry guys this too a little longer than usual…got a bit sidetracked with work. 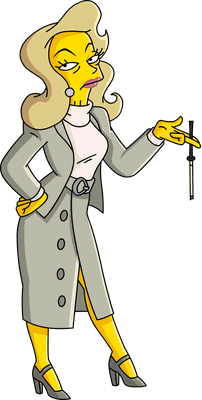 As mentioned above Brockman starts things off with the prompt to build Spiffany’s…. Lots of premium stuff with this update…and it’s all about Malibu Stacy! Malibu Stacy Headquarters- 165 Donuts. 4×10 in size. Instant Build. Comes with Stacy Lovell. Stacy’s Dream House- 55 Donuts. 6×10 in size. Instant Build. Lisa Lionheart Display- 50 Donuts. 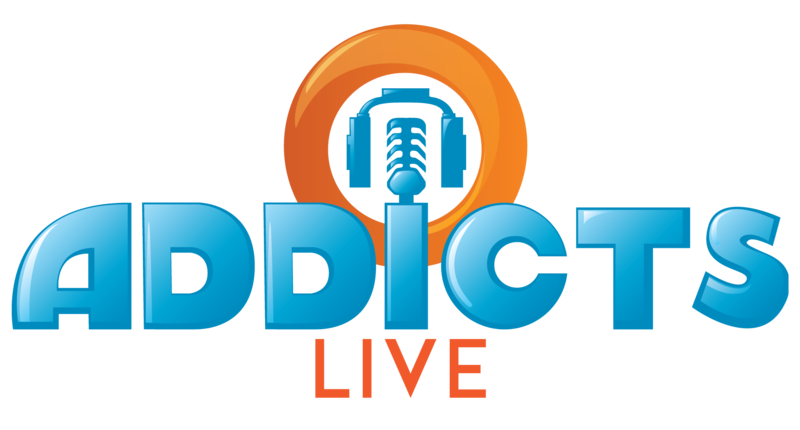 Adds 2.25% bonus on all cash and xp. 2×2 in size. Not unique. Stiletto Sculpture- 40 Donuts. Adds 2% bonus on all cash and xp. 3×3 in size. Not unique. You’ll start off with the basic ground pool that’s $5,000. You’ll then have to upgrade it (like Money Mountain). What are your thoughts on Level 53? 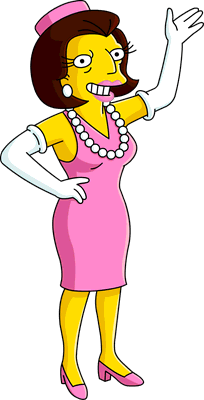 Thoughts on Mrs. Quimby finally arriving in town? How about Malibu Stacy? 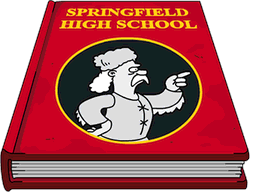 Are you excited there’s finally a pool in Springfield? Sound off in the comments below, you know we love hearing from you! 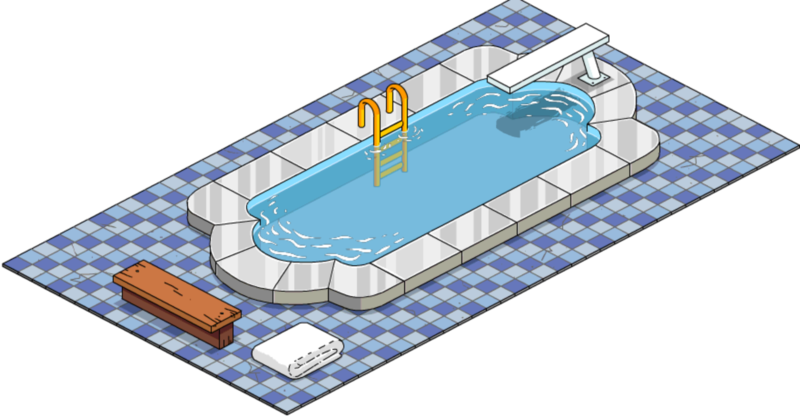 This entry was posted in Buildings, Characters, Tips and Tricks, Updates and tagged Lisa Lionheart, Malibu Stacy, Martha Quimby, Stacy Lovell, Tapped Out Tips and Tricks, The Simpsons Tapped Out, TSTO Addicts, TSTO Level 53, TSTO pool, TSTO pool upgrade, TSTO Tips and Tricks. Bookmark the permalink. I got a pool and upgraded it to the max upgrade but on the pt 3 task it still says i need to upgrade it. I have now purchased 4 pools to the full upgrade and its still saying i need to upgrade. Can someone help?? Known issue. All over the site, EA forums, etc. All you can do is add your name to EA and wait. Just go to the forum and locate the issue. (You can log in there the same way you log into your game) and add your comments. 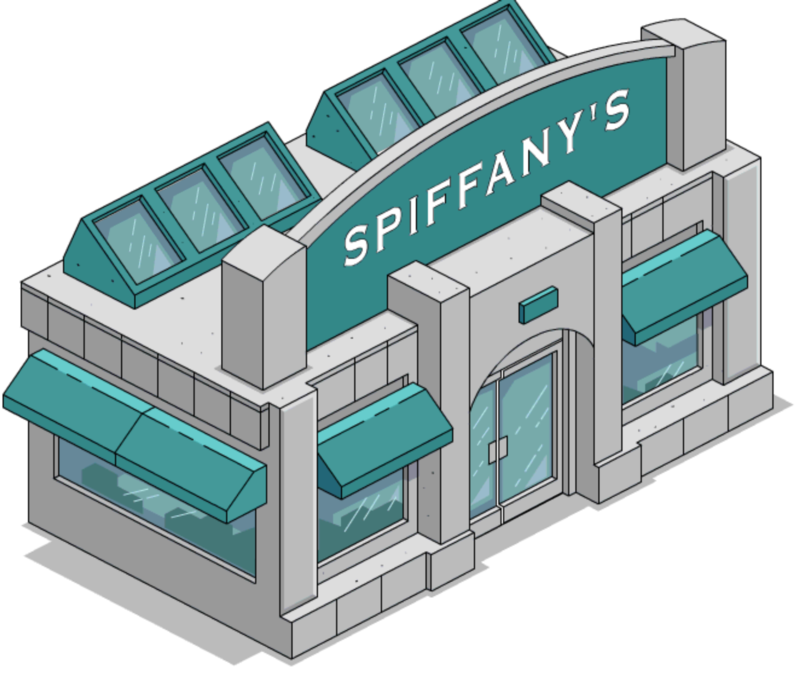 Do I have to build Spiffanys ? Will it stop me from unlocking level 54 items if I don’t build it ? Yes. You’re required to build the building and unlock the character released with each level before moving onto the next level. I placed my pool then upgraded and nothinh happened. I tapped upgrade pool again and it just gave me the option of placing another pool. 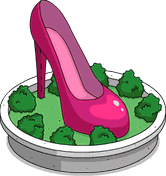 Did you build The Slaughterhouse and unlock Luch Lady Dora? What are the names and Part Numbers of all the open tasks in your menu? Level 54 fixed everything, for some reason…I was able to do all the quests and build the older stuff…thanks a lot! Does anyone know what’s wrong with my game? 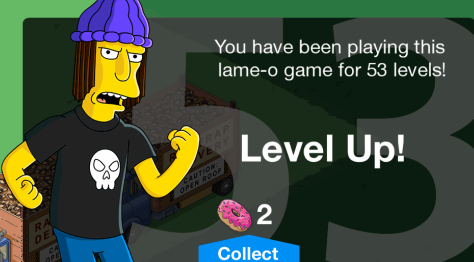 The problem I’m having is I’m not leveling up….I get xp points but when it gets full it give the bonus donut thing and wipes out my xp and starts all over….in stuck on level 53. And another thing is i don’t have any storyline quests. It’ll give me one thing to do like Bart has sleepover and then when that’s done there’s no story or quest but maybe a character going to kwik mart or something. ….helllllp! That’s because Level 53 is the highest level. It awards a bonus. Once you max out your XP you get to play the bonus game and then the xp counter starts over again…higher. However, once a new level hits you will automatically start on the new level. Nothing to do until a new level hits…. Nothing to do at level 53??? I’m still piling up money on Mr. burns moneypile! Well..questline wise. Like new ones popping up i meant. I feel so dumb…lol…thank you so much for answering my question! Can’t wait for a new quest! I have one more question. …a friend of mine had a guy pride float/stage thingy and I never had an option to buy it or get it from a quest…..the pride thing is no longer even on my game….dunno if it’s off of everyone else’s too but it’s over on mine and has been for a few days. If you know how to get the float, please fill me in…..thanks again! That wasn’t something offered. Can you take a screenshot of it and show me what it looks like? And the little tasks you’re getting are just “filler” – they’re just there to give you something to do and aren’t part of a questline or anything. Um, I’m a bit late but I got the pool and then by the next day it was upgraded to the max…. I never upgraded it. What is this witchcraft!? Oh, so THAT’S where my money went… sometimes I will tap on things in other towns to see if they animate or make noise. I hope my neighbor appreciates the free upgrade! Agreed. I read it in the list of ‘what’s new with this update’ on the App Store itself. Mysterious! The weirdest thing just happened. Visiting a friends SF and after tapping their pool, a window popped up to upgrade it to level two for $10000 and my god if I aren’t the dumbest tapper… tried to exit and totally clicked on it. How in the world was i able to do that? Lol went back to MY SF and lo and behold, I am 10K poorer. Has this happened to anyone else? Soooo weird! Yup. Happened to many of us. Lol. That’s interesting…it would also be very interesting to know if the owner of that town now has an upgraded pool from their perspective, too! Yes it happened to me :[ i came here to see if anyone else was having the same issue, thought I was going crazy!! Just happened to me and my husband, glad to find an explanation and know we aren’t alone! I clicked it just to see what would happen. I don’t have a pool yet but it did award major XP just for level 1 to 2. Ok… I got the level 53 when hit but I don’t have anything still starting up???? What gives… I added the lunch lady yesterday thinking I had to play that quest to get to the new stuff but still nothing… What do I need to do? 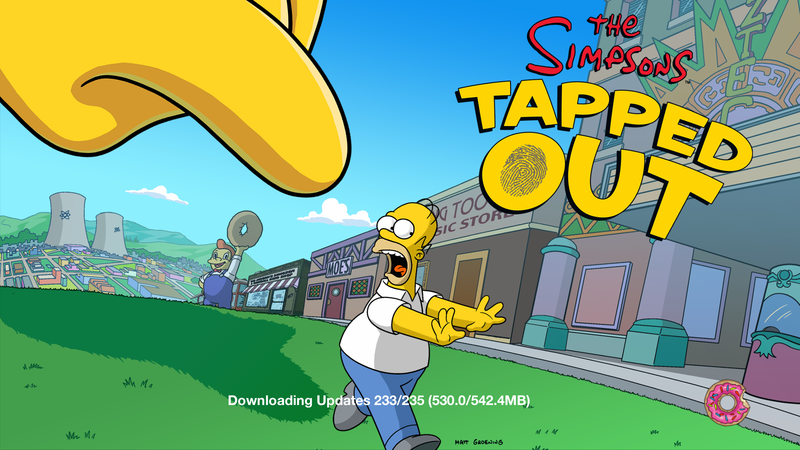 Still haven’t started this level yet after spending all in game money buying more land during the terwilliger event. Should be able to afford spiffanys by Monday. Does upgrading the pool actually do anything apart from changing how it looks? Thanks. unless upgrading is required for the quest line will probably hold off on upgrading it for a while then when I get it so I can save up money. Anyone else having crash or no loading issues with the update? I have to try at least twice before the game loads up. Try to free up some memory space to see if that is the issue. It could be that or Connection. WiFi is the best. Good, strong, stable connection. Make sure this is the ONLY app running when you go in the game. Kill all others on your device. Make sure it has 2-3GB of “wiggle room” on your internal device storage to run. It is a high memory type game and uses a lot. Inside the game, make sure your Characters not in use are sent to indoor tasks as much as possible. It helps on memory drain as it takes extra space and time to show their outdoor activities, even walking around. Try to keep Buildings and Decorations down. Lots of cool things in the game, but you don’t have to have it all out all the time. I make seasonal areas to keep rotating seasonal items in and out of. The more you have in your town, the more time and memory drain you put on your device to render all those images and actions. Try some of those and see if they help. Thanks, I will give this a try. i do always have a couple messaging apps in the background. I will see if they are the culprit. Don’t know if you guys have seen it but you can still but captain bob in the premium section. i’ll save 100 donuts and enjoy watching him sing in the opera for free. Hey team! I had a quick question regarding the debris that Homer and Lisa clean up – is there any benefit to keeping a pile of it without cleaning up? I’ve noticed in a few of my neighbours towns that they have piles of the debris. Apart from aesthetics (if you’re creating a rubbish dump) does this add anything beneficial? I started collecting mine in a corner in case but I’m thinking to clear it all up now so I can level up/ get a chance at some sprinkles. Thanks in advance! If I remember correctly, a couple of them had a doughnut inside, but not enough to jump into the trash can for. 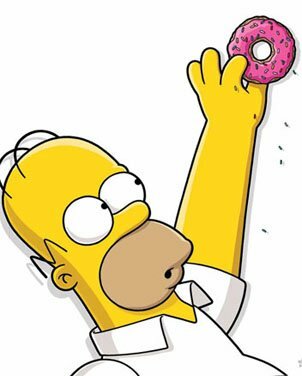 You also miss out on a few free donuts, if you don’t clear out thet rubble. I clean up Springfield debris yet keep some Krustyland debris. If you look closely, some of the debris is a letter of the Krustyland sign. Obviously, I’m making a Krustyland sign. Why do I keep getting so many Rs? This is a weird question considering the fact that several tappers forgot about Krrrrustyland (Krustyland). Krusty always shouts: “Here is KRRRRRRRRUSTY!” at the start of his performance. My spiffany’s isn’t triggering. I’m level 53, I’ve completed Doris. The only thing in my queue is the bear for upgrading the money thing further and sideshow bob doing something like laughing at Bart for having good comebacks. I see spiffany’s in the item menu but it’s grayed out. All my characters are available for tasks. Help! Deng you EA! I was holding off on purchasing the Monroe therapy center and bought a bunch of land to make room for it when the price would drop. I felt a new level coming on, and then they do this! So now, it will always have five price levels, correct? Saw the new post.mthanks for the info! Haha Alissa, love your dedication! 😀 Got sidetracked with work! Thanks for all this! Does anyone know if any of the characters interact with the pool? Would be cool if there was a visual task associated with it. Woo, I can replace the fake river-tile pool at the Quimby compound with a real pool! Glad I didn’t get the tractor, since the two premium decorations are only slightly pricier but with more than double the bonus each. I suggest y’all check your conform-o-meter, as mine just slipped and I needed to,add to my Tree Hugging. No real issue, but glad I caught it quick. It happens every level. The requirements will change. Alissa do you have any advice on how to hit max level? I am level 51, about to hit 52 which was max earlier when bam! Level 53. Do you know how to hit max level and not be constantly be playing catch-up? If you have in game cash to spare… buy and resale Bloodmobile or Rat Trap Trucks for quick boosts. Who you callin’ a ho? You mean the one in the speech bubble above Santa?